In this article we will take a quick look at the Roger Federer Biography and then move on to break down his game. But first have a look at Federer’s forehand in slow motion. The Federer Forehand – Possibly the best shot ever in Tennis! During his early junior years it was already obvious that Roger has a huge talent for Tennis. He was a successful junior player winning several national titles. His primary coach was an Australian named Peter Carter. To this day Roger Federer credits him for a lot of his success. At the age of 14 Federer left his family to live and train at the national training center of the swiss federation. Roger himself was very determined early on to become a professional tennis player and the decision was made at age 16 to leave school and focus on his tennis career. Most people saw him as a big talent throughout his junior years; yet it was not until a very successful year in 1998 that people started to talk about him as a future world class player. In that year he reached the semis of the Australian Open, won at Wimbledon and concluded the year with a title at the prestigious Orange Bowl Junior Tournament. He finished the year as the number one player in the world in Junior Tennis. The transition from the juniors to the pros can be really challenging and it was not entirely easy for Federer as well. In his first pro year in 1999 his best result was a semi-final on the ATP Tour in Vienna. He finished the year just inside the Top 100. His second year he reached the final in Marseille and finished the year ranked 29 in the world. In 2001 he won his first ATP Tour title in Milan. In his first couple of years he struggled at the Grand Slam tournaments though and it was not until Wimbledon 2003 that he won his first major title. From then on he has pretty much dominated the men’s game! Looking at the four areas of Tennis (technical, physical, mental, and tactical) it seems hard to single out one area since he is so good at everything. That being said, I think most experts would agree that he has taken the game to another level when it comes to technique. Roger Federer can do pretty much anything on the tennis court and this is mainly a result of his unbelievable technical skills.He can dominate from the baseline with his lethal forehand, he can defend with his slice, he can play at the net and he can serve and volley effectively. His forehand is often considered as the best forehand of all times! He runs around his backhand a lot to use his powerful forehand from all over the court. Roger Federer plays with a rather conservative grip with the index knuckle on bevel 3.5 (check out grips video in technique section if you don?t know what I’m talking about). The amazing thing about his forehand is the variety he can use! Roger can hit with extreme topspin, can create amazing angles, and can flatten out the shot to hit incredible winners. Check Out This Incredible Angle From Federer! He uses a variety of different finishes or follow-throughs to accomplish this. A lot of his competitors have strong forehands as well but I cannot think of anyone that can use the forehand in so many different ways. Many players are good at hitting either heavy spin or rather flat shots but very few can use the forehand in so many different ways! An interesting thing to note is that Federer plays most of his forehands with a straight hitting arm whereas most pros have at least a slight bend at the elbow. The other well-known player that hits with a straight arm is Rafael Nadal by the way. It will be interesting to see in the future whether or not this is a trend developing. Rogers backhand is a beautiful and technically very sound shot! Most of the time, he hits it with a lot of topspin. Only rarely does he flatten the shot out trying to be more offensive. Most likely his mindset is to be consistent with the topspin backhand in order to create opportunities to dominate with the forehand. Obviously this game-plan has worked extremely well for him and yet I do think he would benefit from developing a more offensive mindset at times on his backhand side. Since he can hit the backhand so clean, I don’t see a reason for him not to be a bit more offensive with it. Rafael Nadal. The extreme topspin from Nadal?s forehand is of course difficult to deal with but at times when Federer decides to step in and be more offensive with his one-hander against Nadal?s forehand shots it seems to work very well for him. In general I think that hitting his backhand more aggressive is a major component for Roger to play at his absolute best! Roger has a very good slice backhand as well. He uses the slice to neutralize when he is on defense, he uses it to mix up the pace, he uses it to lure people forward and he uses it to approach the net at times! As great as his slice is, I do believe that he hits it with too much underspin at times. His racket face gets very open sometimes, causing a strong downward move of the racket at impact which results in a floating slice shot. A slice that floats up in the air is much easier to attack for opponents; ideally you want your slice to be more of a low shot that moves through the court rather than stop when it hits the ground. Roger’s serve might be his most underrated stroke! Why do I say under rated ? Doesn’t everyone agree that he has a very good serve ? Yes, people widely acknowledge that he has a very effective serve, yet since he does not serve as fast as Roddick and some other guys in the Top 20, his serve often does not get as much credit as it deserves in my opinion. Roger’s serve is very hard to read and he uses unbelievable precision that is at least as effective as the sheer power of the Roddick serve for example. During Wimbledon, the BBC once showed a clip where they synchronized and placed two of Roger?s first serves over each other. One was a slice down the middle in the ad court and the other was a flat out wide in the ad court. The result was that everything about the serve looked exactly the same until just a tiny fraction before contact! The ball toss was in the same location, the racket moved identically and the body positions were all the same until just before contact! This is what makes a serve very hard to read and therefore very effective! Check out Roger’s serve in slow motion! In order to develop a great serve yourself you need to learn the key body positions necessary for a great serve. 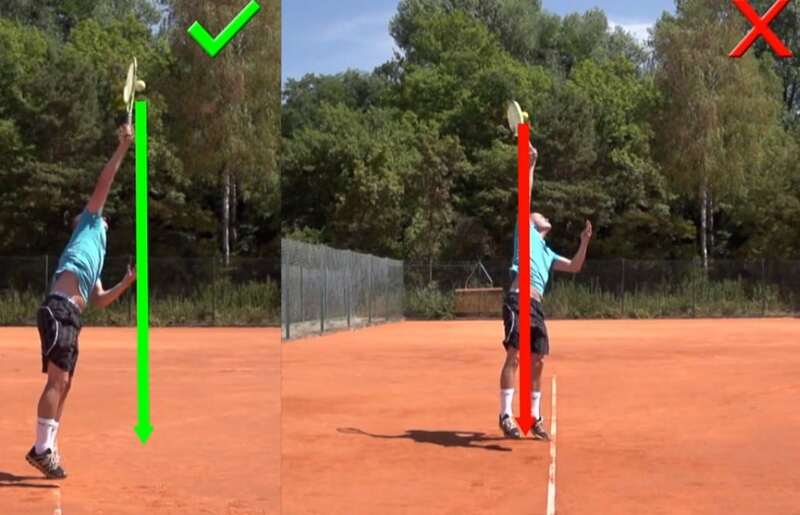 To learn more about developing the key body positions check out the tennis video instruction page on this website! Roger is an excellent net player! His volleys are solid and even though he plays mainly from the baseline he can decide to come to the net more often whenever he feels it is necessary. To me his forehand volley is definitely the stronger side. Here he is very good at simply sticking the volley with a short motion. On the backhand side he is also strong; yet I do feel that similar to when he hits his slice, the racket-face is too open at times and he tries to hit with too much under- and sometimes even sidespin rather than sticking the volley with a relatively flat racket face at impact. Roger knows how and when to play offense, defense and neutralize. He often uses his slice in combination with his great movement to neutralize and get back in the point where other players would be forced to try a winner on the run for example. When it comes to his serve he is smart about placement and knows which serves against which players will allow him to dominate the point with his forehand after the serve. Additionally he can play the net well whenever he feels it is necessary. It is important to remember though that Roger?s great technical skills give him all these options in regards to tactics! If you want to stay up-to-date on my analysis of the current pro game sign up for my free newsletter right here! When ranking Roger for the four areas of Tennis it is very difficult for me to decide whether his technical skills or physical skills should be at the top! Roger moves unbelievably well and effortless on the court. Many of his fellow pro players have singled out his movement as his best asset. Usually the greatest players of any era have also been the best movers! The amazing thing is that Roger seems to never be out of balance no matter under how much pressure he is. If you look closely at Roger, you will notice that he manages to keep his back straight and work from the legs in situations where other players could not do the same. He keeps great posture in these difficult situations which allows him to be more balanced than other players. Like most top tennis players, he has incredibly strong legs and his upper body appears rather slim. The particular footwork patterns that he uses in certain situations are very interesting to study and are also a big reason why he moves so well. 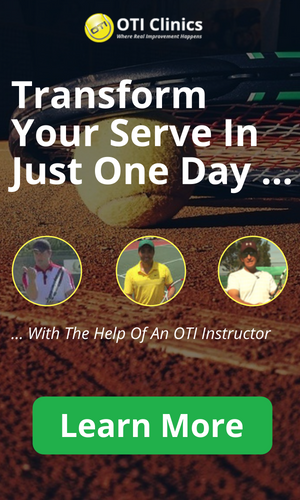 For more info check out the Tennis Fitness Section of the website! Roger Federer is a great champion and would not have been that successful without plenty of confidence and a certain mental toughness. Nonetheless, I believe that the mental side of the game is by far the weakest aspect of his game! During those years when he dominated Tennis, Federer of course had an aura of confidence and a presence on the court that was very impressive. I think his success in those years was due to the fact that his game was simply so much better than everyone else’s game. I don’t believe that it was his mental toughness that made him so successful. Especially in his rivalry against Nadal, Federer seems helpless at times and I do not see the necessary mental toughness for him to overcome that challenge! I think that Roger needs to improve tactically as well as mentally in order to be able to get back to his best form. From a tactical perspective he does not hit his backhand aggressive enough! He has great stroke mechanics on his backhand and yet he most often just hits it cross-court with a lot of topspin hoping to get to hit his forehand. Especially against his rival Rafael Nadal this strategy is not good enough. I would have Federer practice going for his backhand a lot more, taking the ball early and flattening out the shot in the right moments! Additionally, I believe he could use some help on the mental aspect of the game, trying to develop more of a fighter/warrior type of mindset! There are some excellent mental coaches out there and I think he could benefit from working with someone like that. So that was it for the Roger Federer Biography and the analysis of his game!